Our third signing in summer 2018, Livingston-born defensive midfielder Andy was with Hibs as a youth and a regular member of James McDonaugh’s development squad. 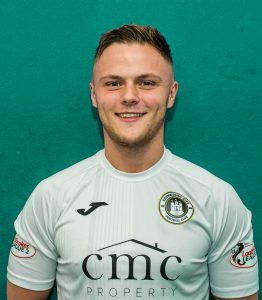 He moved to Dundee in 2014 where he reached the fringes of the first team, and in 2015 went on loan to Forfar Athletic for six months where he made 14 appearances. Andy asked to have his Dundee contract cancelled in 2016 and after a brief spell with Fauldhouse United signed for Stirling Albion in January 2017, where his hard work and unwillingness to give up made him a popular figure.